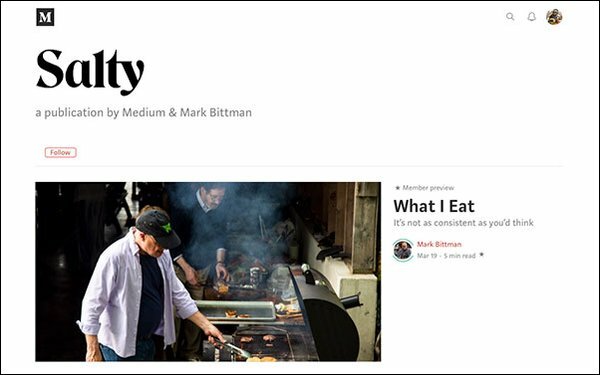 Food writer and editor and former New York Times columnist Mark Bittman is launching a new magazine on Medium called Salty. According to a report by The New York Times, the magazine’s first issue appears today on the publishing platform. The new title focuses on a wide range of issues centered on food, including stories about racism in the restaurant industry and a new parent’s changing relationship to food. Salty will also publish recipes. A cadre of media veterans will join Bittman, who has worked with New York and vegan meal-kit start-up Purple Carrot, in addition to publishing 20 books and writing for The Times for more than 30 years. Dining critic for The Pittsburgh Post-Gazette Melissa McCart, former Time Out New York restaurant critic Daniel Meyer and Bittman’s daughter Kate Bittman, who serves as public relations consultant, are all participating. Medium has been signing up new publications to its platform after investing $5 million in publishing last year. The platform is said to be investing multiple times that this year. The platform, which is ad-free, relies on subscriptions from readers to support the work. Subscriptions range from $5 a month to $50 a year. According to The New York Times, Medium has given Salty a larger investment sum than other new publications, though the amount was not disclosed.